Treat your library community to a rhythmic, jazzy and DYNAMIC storytelling program! Matthew plays drums, performs stories, and shares insights about the creation of his award-winning books. He presents in English, Spanish, Japanese and jazz! He even includes practical tips on how to hook children on reading for life. A seasoned, versatile performer, Matthew delights audiences ranging from pre-school through 6th grade. Teachers and parents love his programs, too! 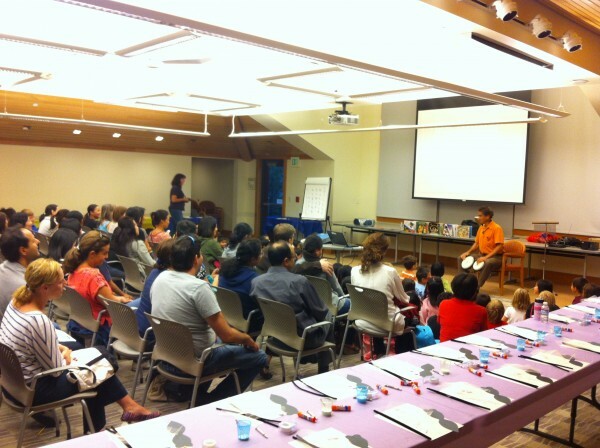 His 18 picture books have garnered over 25 national awards and distinctions. 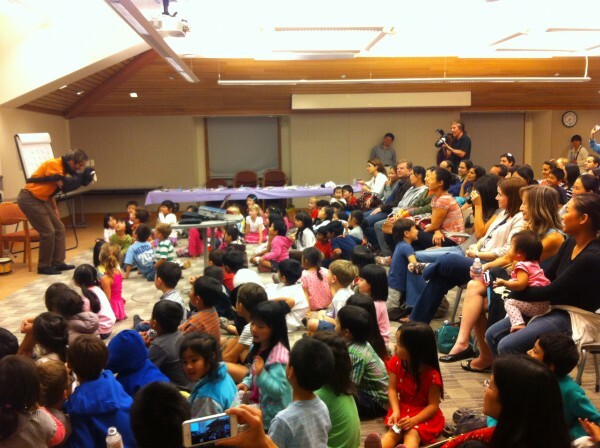 He has performed at dozens of libraries and at over 1,000 schools; his staff will even help you publicize your event. Matthew’s most popular books include The Jazz Fly, and Jazz Fly 2: The Jungle Pachanga which feature his musical narrations on audio CD. His other books such as The Moon Was at a Fiesta make his events a good fit for annual celebrations like Día de los niños (April 30th) and Cinco de mayo. His parenting book, Give the Gift! 10 Fulfilling Ways to Raise a Lifetime Reader contains a wealth of advice on everything from daily reading customs to limiting children’s time on videogames! Matthew’s Asian-themed books (Ten Oni Drummers and Cool Melons—Turn to Frogs!) make him a special draw to more communities still. His typical library program runs 40-45 minutes followed by book signing. Matthew welcomes the opportunity to tour a number of libraries if traveling far home his home in northern California. If you wish to schedule a single event, and your location is outside of California’s Bay Area, it’s best to piggy-back a program onto an existing tour. Please check Matthew’s speaking calendar to see when he will be in your area. For more information, including fees and availability, please drop a line to Matthew directly at mg@matthewgollub.com. *Matthew’s books for libraries are available through Tortuga Press as well as through wholesalers such as Follett and Baker & Taylor. He brings and takes away books himself as needed for book signing. Matthew Gollub is a multitalented children’s author whose books have received dozens of national awards and distinctions. Among his most popular books are The Jazz Fly (book with audio CD); The Moon Was at a Fiesta; and Jazz Fly 2: The Jungle Pachanga (book with audio CD). 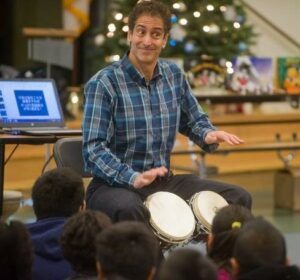 A dynamic, bilingual presenter, storyteller and drummer, he has visited over 1,000 elementary schools around the U.S., inspiring students and families to read for fun. He is also the publisher of Tortuga Press. He lives in Santa Rosa, CA with his wife and son. For more information, including videos and slideshows of his books, please visit: www.matthewgollub.com. Matthew Gollub es un multitalentoso autor de libros infantiles, con los que ha obtenido docenas de premios y reconocimientos a nivel nacional. Entre sus libros disponibles en nuestra biblioteca están The Jazz Fly (con un audio CD), The Moon Was at a Fiesta, y Ten Oni Drummers. Como dinámico presentador bilingüe y tamborilero, se ha presentado en más de mil escuelas primarias de todo el país, inspirando a estudiantes y a sus familias a divertirse leyendo. Vive en Santa Rosa con su esposa y su hijo. Para mayores informes, visite www.matthewgollub.com.